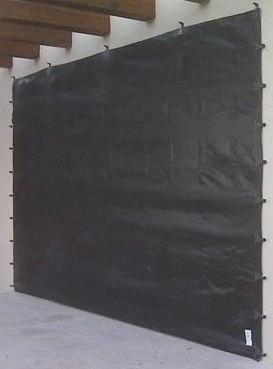 Hurricane Fabric is a high strength, flexible, transparent membrane designed to withstand the strongest hurricane force winds and to deflect large and small missiles. Flexible plastic clips add flex to the system which allows the fabric to decelerate objects more effectively than other screen systems on the market today. Constructed of a technologically advanced, lightweight polypropylene fabric which is 95% solid and 5% porous, it allows natural light and visibility while effectively eliminating high winds and driving rain. Our hurricane fabric is High Velocity Hurricane Zone (HVHZ) certified and wind pressure tested to 195 PSF (276 MPH). Excellent for odd shaped or large patio openings, it can be used where traditional shutters won’t fit. It is lightweight and can easily be deployed by one person. Available in black or beige, it can be folded and stored in the smallest of storage areas.